It’s finally blueberry season here in New Jersey. Hooray! These tasty little gems contain powerful antioxidants that have a lot of health benefits. They are low in fat and full of fiber. In fact, one handful will satisfy the recommended daily fiber intake. Aside from their healthy aspects, blueberries are also great to bake with. I always make sure I freeze a flat at the end of our season here in New Jersey so I have plenty to last through the winter months for muffins, pancakes, smoothies and so on. In a pinch for a quick, healthier, crowd-pleasing dessert for the 4th of July holiday? This Red, White and Blueberry Trifle will do the trick. 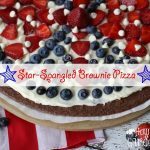 It’s a patriotic pleaser that is great for a 4th of July picnic or any get-together. I love making it because it’s a no bake dessert the can be assembled quickly. I also use all low fat ingredients – like angel food cake instead of pound canke, so you can have all the yummy indulgence with fewer calories. 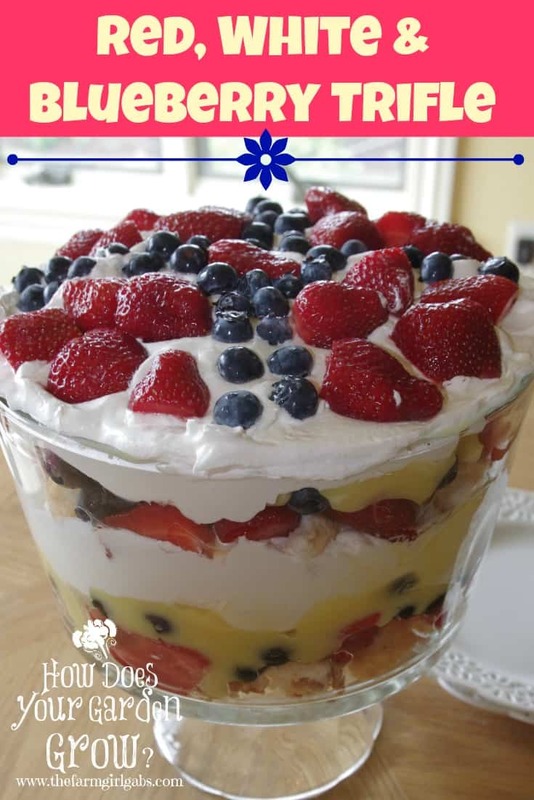 This Red, White and Blueberry Trifle is a patriotic pleaser that is great for a 4th of July picnic or any get-together. It's an easy no bake dessert the can be assembled quickly and feeds a crowd. In medium bowl, prepare vanilla pudding according to package directions. Refrigerate until ready to use. Cut angel food cake into bite size pieces. Clean, hull and slice strawberries. Reserve 1 1/2 cups for the top. Wash blueberries. Reserve 3/4 cup for top of trifle. Gently crush the remaining blueberries to bring out juices. In trifle bowl, start by spreading a layer of angel food cake on the bottom of bowl. Spread 1/2 of pudding mixture over angel food cake. Top with 1/3 of Lite Cool Whip. Followed by 1/2 of the remaining strawberries and 1/2 of the remaining blueberries. For the top / final layer, spread remaining cool whip. Then decorate with the strawberries and blueberries that were set aside. Do you have plans for the July 4th holiday? Hopefully this patriotic dessert will make an appearance at your next party. In search of more great dessert recipes? Check out my favorite recipes pinned to my Dessert Please! Pinterest board. I heart trifle so much! I need to make one for July 4th. All we need is cake – we have the rest of what we need to make this – great idea! I love trifle and haven’t made one in forever. Looks like I’m going to need some more blueberries! That’s a perfect dessert for July 4th! This is my favorite Red, White & Blue recipe to make! The perfect 4th of July treat! 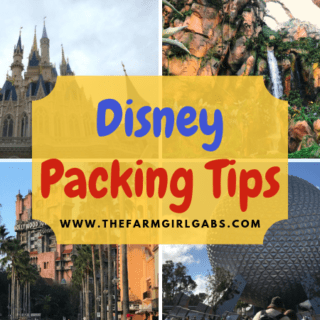 Thanks for sharing on the Thursday Blog Hop! Happy 4th! Melissa, this looks great. I’m heading out to the store to buy fresh berries to make a Fruit Pie Tart in shape of a flag for my sister’s party. This looks delicious though and I’m tempted but I don’t have a beautiful serving bowl like yours. Something to add to the shopping list. Happy Fourth! Your Red White Blueberry Trifle looks wonderful, a great dessert! Hope you have a great week and thanks so much for sharing with Full Plate Thursday.